Lewes, DE – Innocent people are being exonerated in record numbers as new technologies such as DNA become more sophisticated and the Computer Voice Stress Analyzer (CVSA) is increasingly being used for truth verification instead of the old polygraph. This is according to Clifford Payne, an Investigator with the Atlanta (GA) Police Department who also serves as a Regional Director of the National Association of Computer Voice Stress Analysts, an organization representing the nearly 2,000 US law enforcement agencies that utilize the CVSA. Payne stated that before the CVSA, law enforcement had to rely on the old polygraph. “Our main problem was that 30% of polygraph examinations are ‘inconclusive’, meaning that there were no discernible results. With the CVSA, there are always correct results 100% of the time. When you also take in to account that it takes eight weeks to train a polygraph examiner and only five days to train a CVSA examiner, plus the fact that polygraph exams take between 2-3 hours and the CVSA exam can be performed in 1 hour with perfect results, it is clear which system to use.” The Atlanta Police Department discontinued the polygraph in 2003 in favor of the CVSA. Major US law enforcement agencies such as those in Atlanta, New Orleans, Nashville, Baltimore, and Miami, as well as the California Highway Patrol, depend upon the CVSA to investigate criminal cases as well as for screening police applicants. “As an investigative and decision support tool the CVSA has proven itself to be invaluable to law enforcement.” stated Lt. Kenneth Merchant, of the Erie, PA Police Department, who serves as the Legislative Affairs Director for the NACVSA. For further information on the NACVSA, contact Diana Montoya at 888-358-5025 or email to admin@nacvsa.org. For further information on the CVSA visit CVSA1.com or call 561-798-6280. LEWES, Del./PRNewswire/ — According to the National Association of Computer Voice Stress Analysts (NACVSA), the polygraph’s 60 years of dominance as the primary investigative tool to detect deception is drawing to a close. 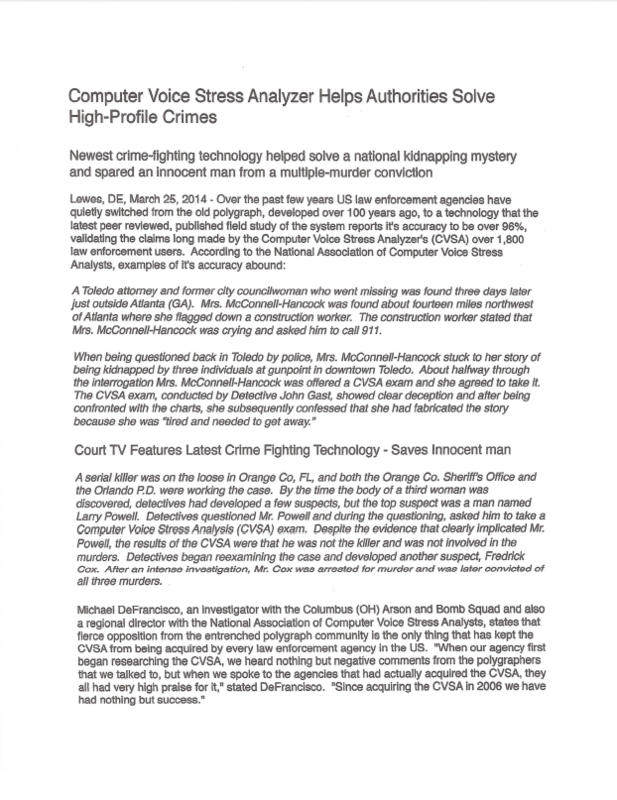 This is based largely on the recent publication of a peer-reviewed study by renowned criminologist, Professor James Chapman, in the scientific journal “Criminalistics and Court Expertise” which validated the accuracy of the Computer Voice Stress Analyzer® (CVSA) to be greater than 95%. Currently only those aligned with the US federal polygraph community and a dwindling number of private investigators continue to use the antiquated polygraph technology. In his explosive book The Clapper Memo, investigative journalist Bob McCarty documents the extensive lengths to which the Department of Defense Polygraph Institute (now called the Credibility Assessment Institute) has gone to discredit the more accurate and less expensive CVSA. McCarty has written extensively on the topic of polygraph and vetting failures leading to preventable “insider attacks” against US military members by Afghani nationals. One of the more than 2,000 agencies that have made the switch to the CVSA is the Citrus County Sheriff’s Office, Florida. In the very first days of the Jessica Lunsford abduction and murder case, Jessica’s father became a suspect. According to retired Citrus County Sheriff’s Lt. David Wyllie, then the head of the Special Victims Unit, he requested Jessica’s father take a CVSA examination shortly after her disappearance. Jessica’s father agreed, and the CVSA cleared him as a suspect. However, investigators from the Florida Department of Law Enforcement (FDLE), a polygraph hold-out organization, decided to conduct a polygraph of the father. 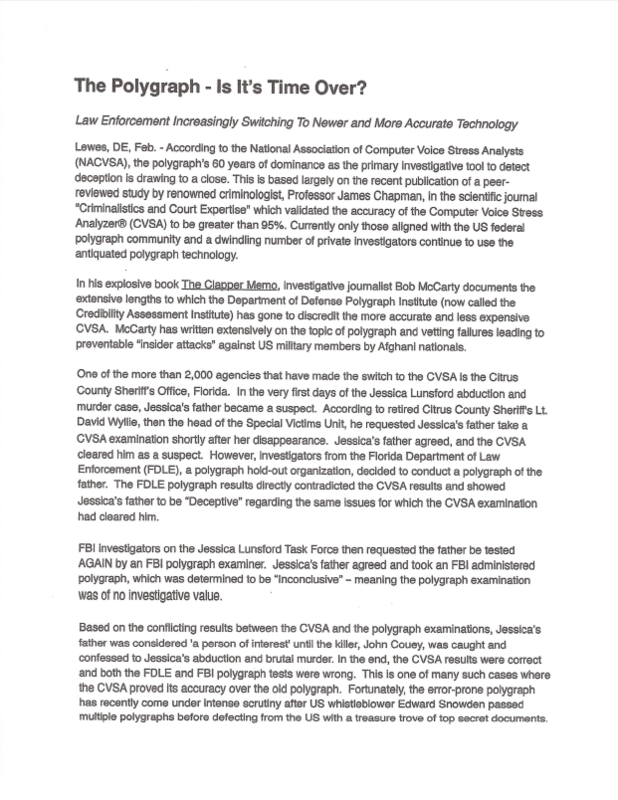 The FDLE polygraph results directly contradicted the CVSA results and showed Jessica’s father to be “Deceptive” regarding the same issues for which the CVSA examination had cleared him. FBI investigators on the Jessica Lunsford Task Force then requested the father be tested AGAIN by an FBI polygraph examiner. Jessica’s father agreed and took an FBI administered polygraph, which was determined to be “Inconclusive” – meaning the polygraph examination was of no investigative value. 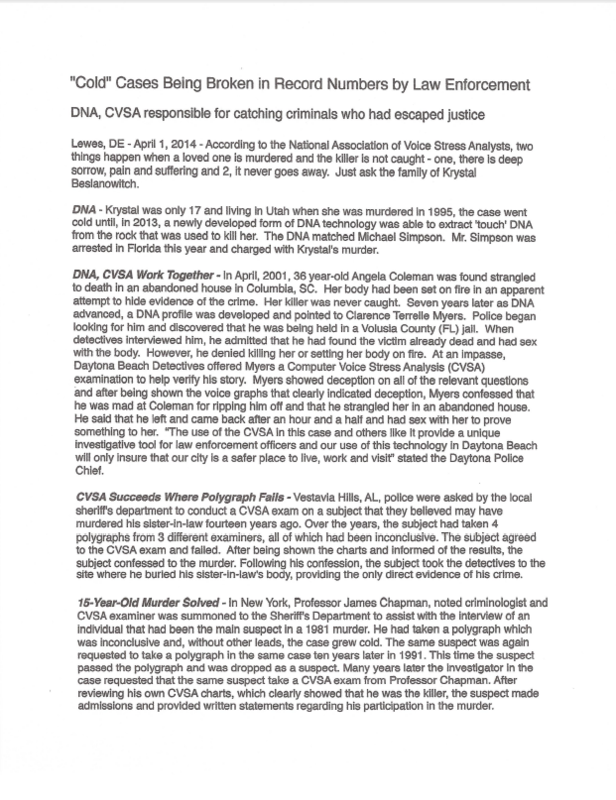 Based on the conflicting results between the CVSA and the polygraph examinations, Jessica’s father was considered ‘a person of interest’ until the killer, John Couey, was caught and confessed to Jessica’s abduction and brutal murder. In the end, the CVSA results were correct and both the FDLE and FBI polygraph tests were wrong. This is one of many such cases where the CVSA proved its accuracy over the old polygraph. Fortunately, the error-prone polygraph has recently come under intense scrutiny after US whistleblower Edward Snowden passed multiple polygraphs before defecting from the US with a treasure trove of top secret documents. Many in the federal government have stated the Snowden case is the beginning of the end of the federal polygraph program. With major US law enforcement agencies such as those in Atlanta, New Orleans, Nashville, Baltimore, Miami, the California Highway Patrol, as well as the US Federal Courts now depending upon the CVSA as an investigative tool for both criminal cases and to screen police applicants, it appears as though polygraph’s days are numbered. For more information about the CVSA please visit CVSA1.com, NACVSA.org or contact Lt. Kenneth Merchant at 888-358-5025 or email. Read more news from the National Association of Computer Voice Stress Analysts. Lewes, DE – (SBWIRE) — A decision by senior US Department of Defense leaders to field an unproven and unreliable portable polygraph system, combined with a flawed vetting program administered by members of the Afghan government, may have contributed to the latest insider attack on US and Coalition forces according to the National Association of Computer Voice Stress Analysts. This attack resulted in the death of a US Army general and the wounding of at least 17 other US and Coalition members, including a German general. Statistics professor Stephen E. Fienberg, who headed the National Academy of Sciences study of the polygraph, found insufficient scientific evidence to support using polygraphs for national security applications. Fienberg stated about PCASS “I don’t understand how anybody could think that this is ready for deployment. Sending these instruments into the field in Iraq and Afghanistan without serious scientific assessment, and for use by untrained personnel, is a mockery of what we advocated in our report.” Further complicating this matter, PCASS was deployed to both Iraq and Afghanistan without being tested for countermeasures. It is well know that countermeasures for the old polygraph are numerous and available worldwide on a multitude of Internet sites, making both the old polygraph and its modern counterpart, the PCASS, easy to defeat. Serious flaws in the process used to vet Afghan military and police members, as well as the unreliability of polygraph, were highlighted in “The Clapper Memo” a book by author and investigative journalist Bob McCarty. McCarty chronicled the poor decisions made by bureaucrats in Washington DC, to ensure the flawed polygraph and the PCASS were used exclusively within DoD, despite scientific proof of a better technology was successfully used both in Iraq and Afghanistan until the Federal Polygraph establishment had it banished. The US technology, known as the Computer Voice Stress Analyzer or CVSA, is now used by approximately 2,000 police, military, security, and intelligence agencies worldwide – but remains banned by the US DoD because of a memorandum signed by James Clapper, the controversial Director of National Intelligence. For further information on the NACVSA, contact Diana Montoya at 888-358-5025 or at Admin@NACVSA.org. For further information on the CVSA visit CVSA1.com or call 888-266-7263.